Sadly, this story is not a parody. After taking steroids for an asthma attack, one young woman named Shanyna Isom developed a very strange and disturbing reaction. 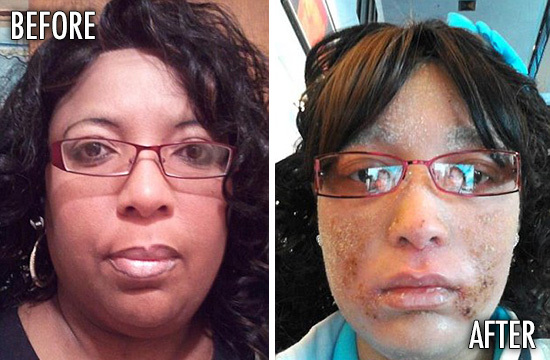 First displaying a serious allergic reaction to the drugs and turning her legs black, Isom ultimately developed a life-crushing skin disease that causes her to grow fingernails instead of hair. The ‘disease’ has cost her almost a quarter of a million dollars in healthcare bills, but more importantly has crippled her lifestyle. Note: the photos of Isom’s condition may be disturbing to some, however you can view the photos here if you would like to. When and where Isom would normally grow hair, nails grow instead. She now takes a total of 17 prescriptions to attempt to deal with the condition and its pain, each with their own set of side effects. On average, drug labels contain around 70 listed side effects, with many containing as many as 525. In Isom’s case, the use of the drug ultimately led to her body producing 12 times the number of skin cells per hair follicle. As a result, her skin is suffocated and the problem arose. What’s amazing is the fact that Isom still continues to take over 17 more drugs to combat the debilitating condition that arose from her initial drug use. For those suffering from asthma, natural solutions do exist. It’s important to discover how to prevent asthma without the use of pharmaceuticals before resorting to such options. I only saw ONE photo and I saw nothing weird about her hair, but her skin was rather like morgellon's. Where are the other photos?? Some weird gene insertions are used in GMO ingredients, called "biologicals", in drugs.